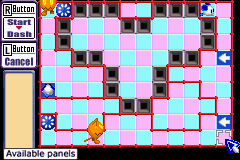 The special puzzles are slightly more difficult - in some cases, they will require placing an arrow so that it points towards a wall. 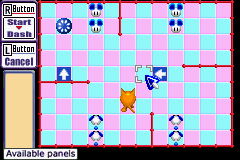 By how the game mechanics work, this arrow placement is used to cause mice to turn in the direction they approached from - and also allows bouncing cats without wearing out the arrows. 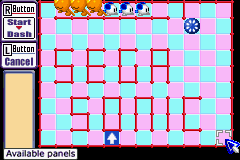 Place the down arrow in front of the mouse, but in the corner. 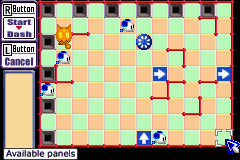 Because of how game mechanics work, the mouse ultimately does a U-turn towards the rocket. 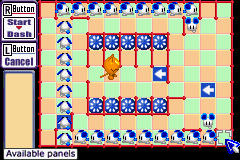 Place the arrows so that the mice reach the exit as quickly as possible. 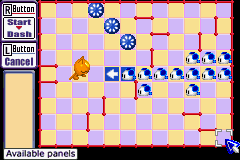 If left alone, the mice enter a loop. 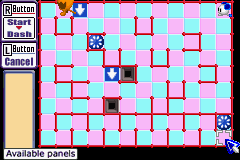 Place an arrow near the top-left to break it, and use a second arrow to get the south-east mice. Place the arrow under the "O", which causes the necessary u-turn. 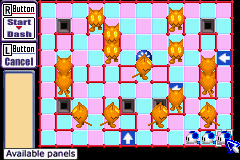 This is a timing puzzle - make sure the mice slip past the cats. 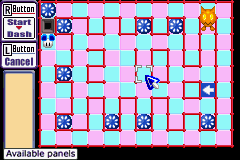 Place the down arrow one tile below the mouse. 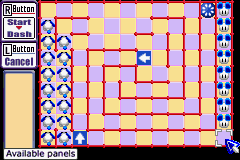 Place the arrow two two tiles right of the mouse. 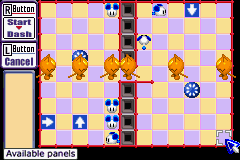 This is a timing puzzle - solve the right-hand first, then the left. 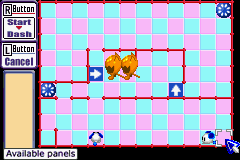 Place the arrow in the path of the cat, so that it points towards the enclosed tile. This causes the cat to make a u-turn, without degrading the arrow. 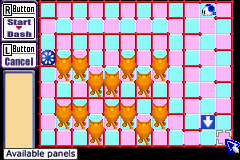 Solve the bottom-left room first by delaying the cat. 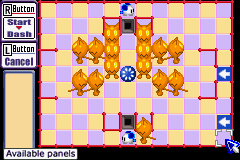 After this, solve the other three rooms. 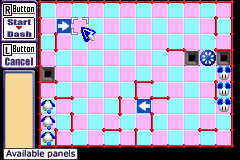 Standard maze - place an up arrow at the bottom, and a left arrow just before the exit. 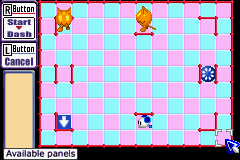 Top-right mice will catch-up to the cat. Send them left to the rocket, then send them up. 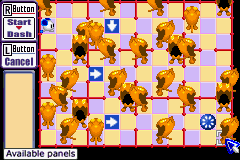 Standard maze, which is easy to solve. Timing puzzle. Place the down arrow just before the last row. 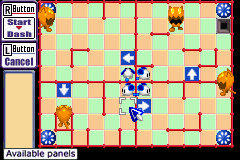 Use the up arrow to direct mice to the rocket, and the right-arrows to collect them into a single path. 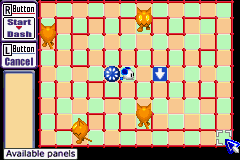 Delay the cat by placing the left arrow below the middle rocket. 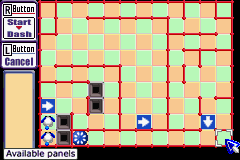 Then, place an up arrow below the right rocket. Run past the gang with proper placement of the down arrow. Then, use the right arrow to send the mouse on the way. Catch the two cats in the center. 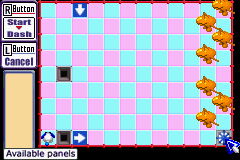 Use a down and right arrow to guide the mouse to the rocket, but use another arrow to clear up one of the pens. Place an arrow just right of the mouse, and another left of the pit. 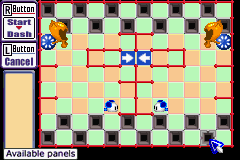 Reverse the direction of the cats twice. This should buy enough time, and keep them out of the way. Use the arrows to dodge the cats. 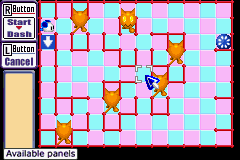 Use an arrow to send the cat to the left, and use another arrow to split the group in two (placed near the bottom-left corner). The final arrow guides the mice to the rockets. 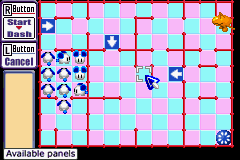 Place the up-arrow on the bottom row to cause the mice to U-turn. 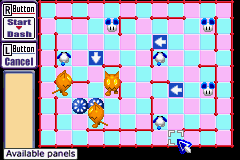 Next, clear out the cats next to the rocket, then place the final arrow to guide the mice to the rocket after they pass the starting corner. This page was last edited on 25 October 2010, at 04:40.